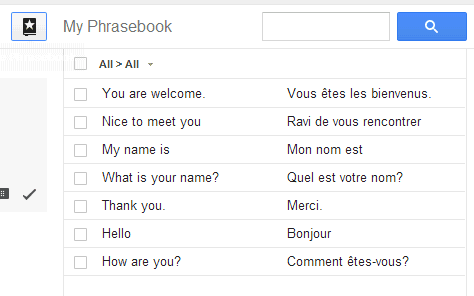 As previously anticipated, Google Translate added a new feature called "phrasebook". It's just a fancy name for bookmarking translations and saving them to a list. You can display the "phrasebook" by clicking the "show phrasebook" button. The list of translations is searchable and can be grouped by language pair. The feature requires to sign in to Google Account so that Google can save the phrasebook. "Phrasebook for Google Translate jumpstarts this slow learning process by allowing you to save the most useful phrases to you, for easy reference later on, exactly when you need them. By revisiting the useful phrases in your Phrasebook from time to time, you can turn any brief translation into lasting knowledge. It's easy to start using Phrasebook. 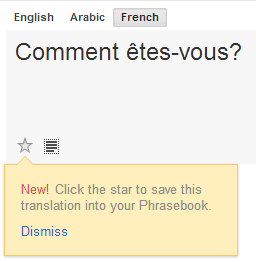 Simply click the star under the translated text to save the translation in your Phrasebook," explains Google. Unfortunately, this feature is not very useful to generate phrasebooks because Google Translate doesn't do a good job when it comes to translating short phrases. "You are welcome" is translated "Vous êtes les bienvenus" instead of "Je vous en prie", while "What is your name?" is translated "Quel est votre nom?" instead of the more common "Comment t'appelles-tu?" or "Comment vous appelez-vous?". Not to mention "Mon nom est" instead of "Je m'appelle". Maybe Google should have generated some phrasebooks with common phrases. is there an api for the phrasebook? to add / delete phrases? Is there an app for this for iphone? I found a google translator app but it doesn't pull in the phrases I have saved in my google account. Anyway you could connect those up? Is there a way to print the phrasebook, not the entire page? It'd be nice to create a little collection of phrasebooks that you can learn from when riding the bus or subway. Where are the phrases stored? I wish they were shared between my phone and my PC. Seems each has its own phrasebook.